The Monroe County Public Library has collaborated with the Monroe County Power Cooperative (MCPC) to install a solar array on the roof of the library building in Union, West Virginia. The recently completed solar system at the Monroe County library generates 8.1 kW of electricity. The 27-panel solar array has a production capacity of 8.1 kilowatts and will supply a significant portion of the library’s electric power needs annually. After careful consideration, the Monroe County Public Library Board of Trustees decided to invest in solar technology, lighting upgrades, and smart thermostats to reduce the building’s energy costs. Together, energy produced by the library’s solar array and energy saved through efficiency upgrades will save the library $2,000 or more each year. “We are excited about this project for both the environmental benefits of solar energy, and the savings on our electric bills,” said Beckie Irons, Board of Trustees President. 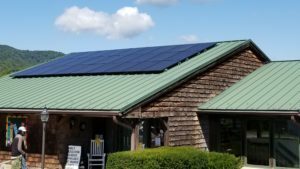 Solar United Neighbors of West Virginia has partnered with the MCPC since 2014 to facilitate more than a dozen solar installations in the County. DT Solar of Buckhannon was selected in the most recent round of bidding for the MCPC’s 2017 solar installations. DT Solar generously completed the library solar installation at cost, donating their professional services and labor as well as solar panels and other equipment to the project. The MCPC plans to raise additional funds to expand the library’s solar array next year. DT Solar has agreed to continue donating their professional services to install expansions to the array. Donations to fund additional solar panels are now being accepted by the Library and are tax deductible. Checks can be made out to Monroe County Public Library and mailed to the library at 103 South Street, Union WV 24983, with the words “solar project” in the memo line on the check.